Click here to be redirected to my new site. I will no longer be posting at this web address. I am leaving blogger for some exciting new digs. You can visit me at www.ishouldbefoldinglaundry.com! I will no longer be posting on this site, but will continue my posts on my new blog. Check it out! I look forward to seeing you there! The song "easy like Sunday morning" is flowing through my head right now. Even though it's Saturday. Friends, it's 11:31am and I am still in my pj's. I'm sitting on my couch, next to Noah, who is next to Anna and they are watching Cars. Daddy is on the other couch, in his pj's, too. Last night, Brian and I had a pig out, wine fest on our living room floor after the kids went to bed. We had this horrible (delicious) chili and velveeta dip, with wine while we played yahtzee. I know the dip sounds terribly fattening BUT we used baked scoops! You know, to make it healthier. I used ALL of my flex points last night. I have my weigh in on Tuesday. I have been maintaining my weight since June. HOORAY!! I think I've got it down. I hope I've got it down. After being being beat by Brian three times in Yahtzee (man, he plays good when he's drunk!) I sweetly asked him if I could sleep in...alot. He said "sure honey, anytime." And I did. Until 10:30 am. ANYWAY, back to the Midnight Movers. They were still there yesterday morning AND all of their furniture was in their house. Of course, their basement could have been cleared out or their bedrooms, my point is this: was there really a point to moving at 2 am? I think not. Yesterday, I purposely did a ton of housework so I could have a lazy day today. I can't remember the last time we had a Saturday to just "be." It's nice and refreshing and I'm scared half to death. I'm not a good sitter. I like to do things. (IN FACT, I bought a pedometer the other day, and I walk 10,000 steps just in my house everyday.) Anna and Noah have their 3rd and 4th Birthdays this month, every year I create a slideshow and every year I finish in the 11th hour. I'm determined to finish early! Also, the remainder of our Christmas decorations will come down today. I hope you all of a great weekend. I leave you with a great picture taken last Monday! Anna and Noah sitting with their Uncles. I'm not a big napper, I like to, occasionally, in the afternoons, rest my head on the throw pillow in my living room and lay down for 10 minutes. I then pop up and drink seven cups of coffee to get me through the rest of the day. My naps were much longer when my thyroid was low and when I was pregnant with #2. But sometimes, I accidentally lay on the bigger, more comfy couch, rather than the love seat. And sometimes, I even grab my throw and cover up my shivering shoulders. And sometimes, the nap then extends to an hour long "nights sleep" rather than a little cat nap. That's what happened to me yesterday. I laid down at 2:55pm, after the kids went to bed and I cleaned up toys. At 4pm, the rain pouring down woke me from my slumber. I looked at the clock and was instantly irritated. I really need to start setting my baking timer to wake me. I'm opposed to big naps because they keep me from sleeping at night. Sure as day, I couldn't sleep. After 90 minutes of tossing and turning, I must have fallen asleep at 1am. Then at TWO IN THE MORNING, I heard this low roaring sound coming from outside. It was constant, it almost sounded like a garbage truck idling in my lawn. I looked out and it was a moving truck at my neighbors house. At 2 in the morning. Who moves at 2 in the morning? (did I mention people were moving at 2 in the morning?) So, I was up again. Thinking about how I WAS sleeping and now I was NOT. Then I started to think about my neighbors. These neighbors moved in just after us, (it's a new subdivision) after a year we introduced ourselves and the mother and I instantly connected. She was pregnant with her second child. Her husband and my husband truly liked eachother. She had her second baby. We would go to dinner, host dinners for each other, we shared eggs and flour and spaghetti sauce. I'd go there at 10 in the evening and sit on her bed with her and we would share stories while our kids slept peacefully. We would have late night scrapbooking with a bottle of wine. The favors were endless. It seemed like we were constantly trying to find ways to do nice things for eachother. It was exhausting. The honeymoon ended and we just stopped talking. Although they lived almost directly across the street from us, we just didn't talk. We had a few ackward attempts to rekindle, but it just never worked. She gave birth to their child in October. And now they are gone. Laying in bed last night, I thought about how I still have her shirt in my closet, which I planned to dry clean for her. Things weren't always so perfect with them. I always felt in competition with them. Always. And I hated it. (I never "competed in return" and I think that bothered them, or maybe it didn't. Who knows?) Although we "connected" we just never really fit together. Perhaps there were too many pieces of the puzzle to connect; if our kids got along, if our husbands got along, if she and I got along, etc. I'm excited about the new neighbor to join our neighborhood. I'm excited to not have that awkward wave driving by. Most of all, I'm excited to have a good night's rest tonight. Seriously, who moves at 2 in the morning? That's me. I have never owned a toaster oven before. Even growing up we always had toaster that held your bread slices upright, with the hot "grill" pressed up against the bread. I never understood why people had toaster ovens, I mean, how could the toast get toasted with out the hot "grill" being pressed up against both sides of the bread. I didn't know they were actual ovens. OVENS! Who knew?!?! Hysterically and sadly, even after my friend Jenn mentioned to me that she made cookies in her toaster oven, I was like, "okay, crazy, you make cookies in your toaster, right!" I couldn't imagine they were good. Then, I asked for one for Christmas. Why? Because I wanted to make chicken fries for the kids in them. I was tired of using toaster bags in my stand up toaster. When asking for a toaster oven, I was sure to include that it must have a broiler, because I may use it for toast, chicken fries and homemade garlic bread. Get all the use out of it that I can, right? Man. Iamanidiot. THIS THING ROCKS. It's an oven, people. I have made taquitos, chicken nuggets, garlic bread AND toast. All in the 2 days that I opened the box. It's like having two ovens, I feel like I have a DE-LUXE kitchen now. I bake and cook almost everyday...this is going down as one of the best gifts of all time. While I am reviewing my Christmas gifts, I'm going to tell you about another MUST HAVE FOR 2007. The Research Alarm Clock. OHMYGODTHISTHINGSETSITSELF. Not only does it set itself...it allows a different alarm time for each day of the week. Not sold yet? 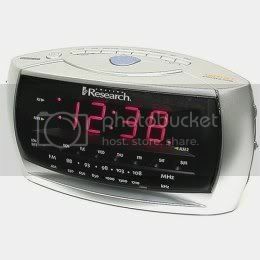 When you snooze your alarm clock, it actually blinks, to remind you that it's snoozing. You know, sometimes you have the OHMYGOD moment where you think you shut it off? Those moments no longer exists. How much does this bad boy cost? TWENTY BUCKS. 4. Read six books this year. I know that doesn't seem like much, but last year I only read 2-3. Any suggestions? 6. Host more play dates, attend more playdates. 7. Date my husband more frequently. 8. Yell at my children (and husband) less frequently. 9. Become more involved with my church. 14. Spend more time outside during warmer weather. 15. Make my blog more interesting to read. 18. Spend more time coloring with the kids. 20. Try 3 new healthy recipes per month...and share with all of you! By the way, I just finished this book, it's a good read, I do recommend it. I like this idea of Wordless Wednesday. Thanks!